The revised third edition has been updated for Stata 14, and it includes a new section on predictive margins and marginal effects, which demonstrates how to obtain and visualize marginal predictions and marginal effects using the margins and marginsplot commands after survival regression models. Survival analysis is a field of its own that requires specialized data management and analysis procedures. To meet this requirement, Stata provides the stfamily of commands for organizing and summarizing survival data. 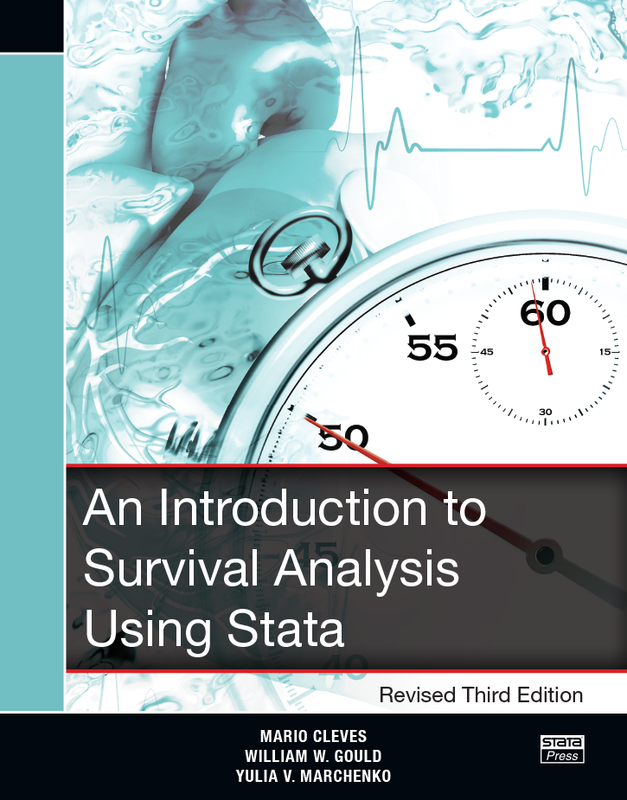 This book provides statistical theory, step-by-step procedures for analyzing survival data, an in-depth usage guide for Stata’s most widely used stcommands, and a collection of tips for using Stata to analyze survival data and to present the results. This book develops from first principles the statistical concepts unique to survival data and assumes only a knowledge of basic probability and statistics and a working knowledge of Stata. The first three chapters of the text cover basic theoretical concepts: hazard functions, cumulative hazard functions, and their interpretations; survivor functions; hazard models; and a comparison of nonparametric, semiparametric, and parametric methodologies. Chapter 4 deals with censoring and truncation. The next three chapters cover the formatting, manipulation, stsetting, and error checking involved in preparing survival data for analysis using Stata’s st analysis commands. Chapter 8 covers nonparametric methods, including the Kaplan–Meier and Nelson–Aalen estimators and the various nonparametric tests for the equality of survival experience. Chapters 9–11 discuss Cox regression and include various examples of fitting a Cox model, obtaining predictions, interpreting results, building models, model diagnostics, and regression with survey data. The next four chapters cover parametric models, which are fit using Stata’s streg command. These chapters include detailed derivations of all six parametric models currently supported in Stata and methods for determining which model is appropriate, as well as information on stratification, obtaining predictions, and advanced topics such as frailty models. Chapter 16 is devoted to power and sample-size calculations for survival studies. The final chapter covers survival analysis in the presence of competing risks.